"Can you hone this razor? I found it in xyz and I don’t know if it’s worth the trouble…” We’ve honed thousands of razors and want to offer up some guidance on the subject. You might be surprised to learn just how far-gone a straight razor can appear on the outside while still being a good candidate for use as a daily shaver! Often a straight razor just needs a little TLC - one of many reasons why straight razors are the ultimate shaving solution! In this post we explain what we look for in evaluating the quality and condition of a straight razor prior to honing and provide some photo samples of what can or cannot be honed. The primary considerations we assess when determining “honeability” are the maker/manufacturer of the razor, materials used, and wear and tear. Other factors which affect the quality of the razor include the workmanship, how it was heat treated, and how it was handled after heat treatment during finish grinding. If the maker or manufacturer is known and the razor isn’t rusted through or burned away by a grinder, it can likely be honed to shaving sharp. Cheap, re-branded razors made in China & Pakistan are an exception. These are widely available online and marketed as “shaving sharp” when few actually keep an edge. We call these things “razor shaped objects” and are easily identifiable by their… shall we say ‘inconsistent’(?) workmanship, mystery metals, and luxury materials (Damascus steel, buffalo horn, brass-lined scales, etc) at insanely low prices. One such manufacturer even stole our process photos in an effort to appear more legitimate! This is a classic instance of “you get what you pay for” and while some of these razors retain a pretty good edge, just know that it’s a gamble as to whether or not a razor matching this description is honeable. If the price seems too good to be true, it probably is. By contrast, a vintage razor which is not rusted through is practically a sure bet (we aspire to have the same said of our straight razors in 100 years!). By virtue of its survival, we can tell that it was made by skilled workers using quality materials. In the case of a vintage razor, the main thing to look for is rust. Light surface rust or patina (discoloration of the steel over time) isn’t much of a problem, but if rust--usually red--has penetrated from one side of the blade to the other, it is unlikely to produce a perfect edge. Diagnosis: it will not hone! - a mirror polish which is very difficult to achieve on a properly heat treated razor with high hardness. The low cost of this razor was disclosed to us and it was a red flag that this razor was most likely not heat-treated properly as a way to save costs on the labor a mirror-finish requires. This vintage Sheffield blade shows some signs of neglect. The red rust needs careful polishing/removal before we can determine how deep it goes, but the edge looks relatively clear of rust! Because the edge is rust free, we’ll have this razor sent in so we may determine if the rust does not penetrate through the blade. If the rust has compromised the blade, we will refund the honing service fee. Vintage razors are almost universally made with high-carbon steels. Some will have brand names like “blue steel” or “silver steel,” but all are of relatively high quality if they have survived a few decades or twenty. High carbon steel is relatively easy to work and heat treat, resulting in harder, sharper blades. The heat treatment is, in reality, the most important invisible step in making any blade. It’s also the easiest corner to cut during manufacturing, since softer metals are easier to grind and errors only become apparent during sharpening. Steel which is improperly heat treated will be softer, more flexible, and unstable in the microscopic dimensions required for a razor’s edge. There are many stainless blade steels available, many of which can make a fine razor steel. We are very proud of our stainless razors and take great care in owning our heat treating process. Even 440C stainless does the job well… if heat treated properly. To retain their stainless properties, they must be heated in an anoxic (oxygen-free) environment. This adds time and complexity to the process, something large manufacturers prefer to avoid. Then, as in any bladesmithing process, they must be ground slowly to final thickness to avoid overheating the blade after heat treatment. Heating the paper-thin blade beyond the tempering heat of the blade ruins the steel by making it soft and unable to take an edge. This is why razors should never be sharpened on grinders: the heat from that much friction is enough to render it useless. This vintage cutthroat by J.A. Henckels has an especially dark patina and some pitting, but no red rust which penetrates through the blade. We’ll maintain the gentle blade curve so that very little metal is removed in the honing process. Our belief is “the less material removed the better” as it extends the life of the razor and we are all about waste reduction around here! This vintage straight razor shows signs of wear near the toe. This can easily be resolved in a normal honing session. In most cases, a quality straight razor can be restored after minor damage or neglect. On the other hand: grinders, salt water, and improper honing can wreak havoc on otherwise perfectly good razors. As mentioned above, grinders can easily create enough heat from friction to affect the heat treatment of a razor, effectively ruining it. Grinders remove material in a heartbeat, shortening the razor’s lifespan and causing irregularities in the razor’s edge geometry. At best, this will complicate any attempts at restoration. At worst: bye bye razor. Salt water is especially problematic for carbon steels. Tap water is bad enough, but salt spray will cause rust at an accelerated rate. If you plan on taking your razor with you for an island getaway, don’t forget to keep your razor dried and oiled between uses! Improper honing isn’t always catastrophic, though it’s much harder to put material back on than to remove it. Hone wear induced over years and years may produce wide bevels and irregular geometries, but these are more a nuisance than a fatal flaw. Most times, material was simply removed unevenly, affecting the final edge geometry. This can be compensated for by removing material in the right places or by adding it artificially, i.e. with tape on the spine to make it thicker during honing. One thing that is often forgotten is the condition of the razor’s scales. The scales are an important safety feature, protecting you from the razor and the razor from you when not in use. For this reason, broken or missing scales need to be addressed before sharpening the razor. Diagnosis: needs scales, but It will Hone! 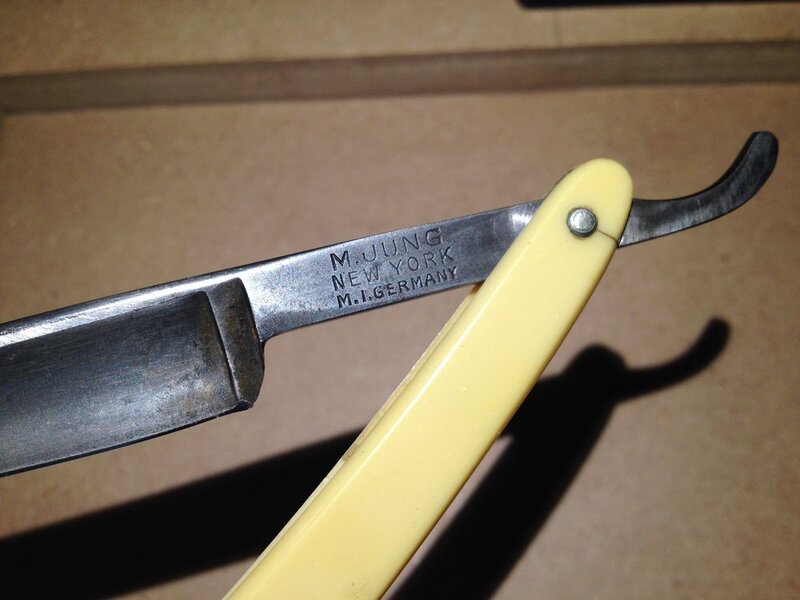 Cracks at the pivot are common, especially in vintage razors like this one. It seems to be holding, but the scales should be replaced if this is to become a daily shaver. Scales are an important safety feature, keeping you and the blade safe when not in use. We can take care of re-scaling and honing this razor will be ready to shave on! Ultimately, a honemeister can only decide once the razor is in-hand and on the hones for sharpening, as some flaws and damage are invisible until sharpening begins. It isn’t terribly common, but it has happened on occasion that invisible flaws and cracks emerge or propagate once the razor has pressure applied to it on the hones. In these situations, it is our policy to refund the honing service fee and return the razor to you. Do you have a razor that needs honing? In doubt as to whether it is worth saving? If you still have questions or think you might have a unique issue, we invite you to shoot us an email to info(at)portlandrazorco.com with photos of your razor in question and we will assess it for honeability!